One of the most deadly forms of modern combat involves the use of chemical weapons. Nuclear, biological, and chemical, warfare is known by the acronym NBC and makes up the weapons classified as unconventional threats to soldiers and civilian populations. Military leaders around the world have stated publicly that chemical weapons pose one of the biggest threats to soldiers in modern combat. The use of chemical weapons is controversial and a moral issue for military and political leaders. Chemical warfare involves the use of toxic chemical substances as weapons. Chemical warfare is not new. Modern chemical warfare began in the First World War when the German Army used mustard gas to burn soldiers in trenches throughout Europe. Various types of poisonous gas were used in both the First World War and Second World War. Chemical weapons are classified as being unconventional as they do not rely on an explosive force to injure or kill. However, modern chemical weapons are increasingly sophisticated and complex. Soldiers today have to contend with a variety of deadly chemicals ranging from nerve agents to blister agents. One of the most deadly chemical weapons is sarin gas. Five hundred times more lethal than cyanide, sarin attacks the nervous system and has been known to kill people less than one minute after coming into contact with the gas. Modern chemical weapons come in a variety of forms. These include solid, gas and liquid. Chemical weapons are delivered using several different techniques, which range from bombs to aircraft to the wind. Some chemical weapons are dispersed using pyrotechnics and explosions. 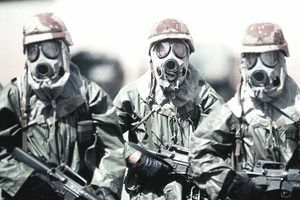 The United Nations has identified about 70 different chemicals that can be used as weapons in modern combat scenarios. The most deadly chemical weapons are classified as "Lethal Unitary Chemical Agents and Munitions." These are the most hazardous weaponized chemicals. The U.S. stockpiles its chemical weapons at a few military bases located around the country. However, the exact location of the chemical weapons is classified information. The most dangerous chemical weapons stored by the U.S. are potent blister agents that cause severe skin and eye irritations. Although not part of conventional warfare, most militaries around the world stockpile various forms of chemical warfare agents. A problem with the use of chemical weapons is the difficulty in targeting only the identified enemy. Your troops, allied forces, and civilian populations may be sickened or killed in addition to the primary targets. Many chemical weapons can remain in groundwater and soil long after they are dispersed, making them an ongoing threat to civilian populations. As old stockpiles become outdated, safe decommissioning and disposal become a challenge for the military. For example, the Umatilla Chemical Depot was the site of disposal operations for GB and VX nerve agents and HD blister agents for more than two decades, with their work concluding in 2011. Ongoing disposal occurs at several sites.